Even though I’ve already made clear that I am less-than-overwhelmed by the thought of Mitt Romney in the White House, I worry that people will become to think I’m a GOP toady. That’s because I’ve been spending a lot of time providing favorable analysis and commentary on the relative merits of the Ryan budget (particularly proposed reforms to Medicare and Medicaid) compared to President Obama’s statist agenda of class warfare and bigger government. I’ve already done a couple of TV interviews on Ryanomics vs Obamanomics and the Wall Street Journal this morning published my column explaining the key features of the Ryan budget. Here are some highlights. In one of my early paragraphs, I give Ryan credit for steering the GOP back in the right direction after the fiscal recklessness of the Bush years. …the era of bipartisan big government may have come to an end. Largely thanks to Rep. Paul Ryan and the fiscal blueprint he prepared as chairman of the House Budget Committee earlier this year, the GOP has begun climbing back on the wagon of fiscal sobriety and has shown at least some willingness to restrain the growth of government. I probably should have also credited the Tea Party, but I’ll try to make up for that omission in the future. These next couple of sentences are the main point of my column. The most important headline about the Ryan budget is that it limits the growth rate of federal spending, with outlays increasing by an average of 3.1% annually over the next 10 years. …limiting spending so it grows by 3.1% per year, as Mr. Ryan proposes, quickly leads to less red ink. This is because federal tax revenues are projected by the House Budget Committee to increase 6.6% annually over the next 10 years if the House budget is approved (and this assumes the Bush tax cuts are made permanent). Some conservatives complain that the Ryan budget doesn’t balance the budget in 10 years. I explain how that could happen, but I then emphasize that what really matters is shrinking the burden of government spending. To balance the budget within 10 years would require that outlays grow by about 2% each year. …There are many who would prefer that the deficit come down more quickly, but from a jobs and growth perspective, it isn’t the deficit that matters. Rather, what matters for prosperity and living standards is the degree to which labor and capital are used productively. This is why policy makers should focus on reducing the burden of government spending as a share of GDP—leaving more resources in the private economy. 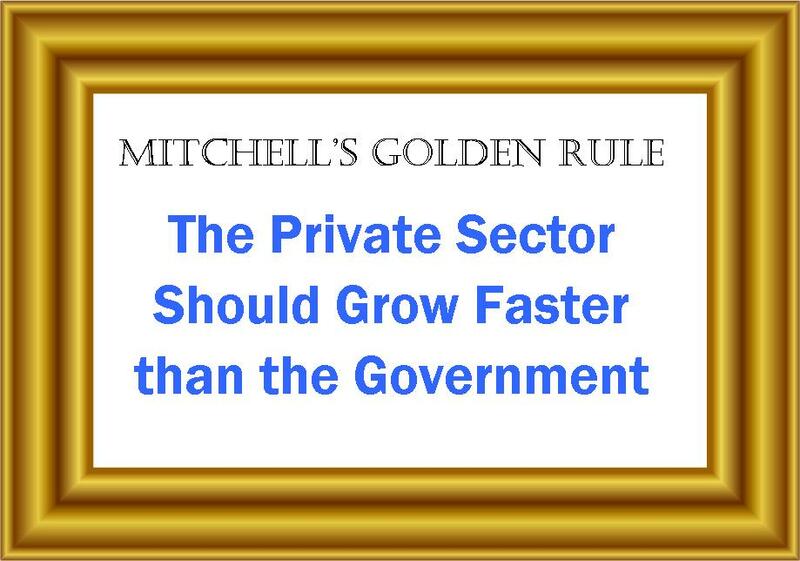 The simple way of making this happen is to follow what I’ve been calling the golden rule of good fiscal policy: The private sector should grow faster than the government. Actually, I’ve been calling it Mitchell’s Golden Rule, but I couldn’t bring myself to be that narcissistic and self-aggrandizing on the nation’s most important and influential editorial page. One final point from the column that’s worth emphasizing is that Ryan does the right kind of entitlement reform. One of the best features of the Ryan budget is that he reforms the two big health entitlements instead of simply trying to save money. Medicaid gets block-granted to the states, building on the success of welfare reform in the 1990s. And Medicare is modernized by creating a premium-support option for people retiring in 2022 and beyond. This is much better than the traditional Beltway approach of trying to save money with price controls on health-care providers and means testing on health-care consumers. …But good entitlement policy also is a godsend for taxpayers, particularly in the long run. Without reform, the burden of federal spending will jump to 35% of GDP by 2040, compared to 18.75% of output under the Ryan budget. The last sentence of the excerpt is critical. If the Golden Rule of fiscal policy is to have the private sector grow faster than government, then the Golden Goal is to reduce government spending as a share of GDP. I’ve commented before how America will become Greece in the absence of reform. Well, that’s basically the Obama fiscal plan, as illustrated by this amusing cartoon. What makes the Ryan budget so impressive is that it includes the reforms that are needed to avoid this fate. No, it doesn’t bring the federal government back down to 3 percent of GDP, so it’s not libertarian Nirvana. But we manage to stay out of fiscal hell, so that counts for something. The future looks dark, for Americans accustomed to being members of the most prosperous country on earth – and taking that fact implicitly for granted. So we have finally arrived to the point where the most radical, of the politically feasible economic scenarios for the US is the Ryan plan. Far out in terms of probability of being adopted will all its spending restrains but still within the realm of politically possible outcomes. Yet, even this “most radical” of scenarios leads to an increase in government spending of “only” 3%, compared to the 5-6-8% that the entire spectrum of “compromise” or HopNChange competing alternatives portend. A 3% annual increase already violates Mr. Mitchell’s rule. That is because we have, in all likelihood, already entered the “New Norm” or sub 3% annual growth. The production dis incentives created by ObamaCare alone (like: reduce your production below 90K per year and someone else, someone smarter, someone more competent or simply someone harder working will pay for most of your family’s healthcare) are enough to knock US growth rate down to a permanent sub 3% growth trendline. And that is only one piece of legislation and it is only the beginning of the irreversible descent towards European style effort-reward incentives. It’s also only the beginning, because, once the public starts feeling the stress of slower growth there will be inevitable calls for ever more “help” read “government help” read “redistribution and regulation”. This is how the scenario has played out in virtually every European country that went down this path, even before the creation of the European Union when European nations were still free to each independently choose their economic destiny. They all followed the same siren song and stepped on the same banana peel. So the best possible American scenario has boiled down to a 3% growth in government against the backdrop of European like growth (i.e. a 1-2% growth trendline — and that is only for the more productive of European countries). So the way I would describe this unlikely adoption of the most optimistic plan, the Ryan plan is: “Slow down the rate of decline and hope of better electoral times down the line”. Alas, this is the radical scenario. On the other end of the spectrum there is a litany of HopNChange scenarios which increase government spending at much faster rates. In that light, the descent into Francification or even Hellenization seems inevitable. While not apparent in everyday life, by the measure of a historical time scale, the rate at which the US is declining is breathtaking. Future historians will write that the speed at which the United States declined in the early twenty first century was unprecedented. It is perhaps all consistent with an ever faster moving and still accelerating world. Everything is now happening much faster. Rises and declines that once took centuries, will now complete in a mere few decades, and that is a good thing. Let the more efficient replace the less efficient at an ever faster rate. In practical terms, rather than rest your hopes into the Ryan plan being adopted, which will cause government spending to outpace GDP growth by only 1% (i.e. reduce the rate of decline to a minimum), it would be far better to teach your children how to be international citizens. Economic mercenaries who will be recruited by those future nations that welcome them and grant them free reign to create prosperity for all and also let them keep their full personal reward. While the suicidal western citizen voter lemming is declining — fast converging towards the worldwide prosperity average — humanity as a whole is poised to continue galloping at 5% annual growth. Don’t be myopic. If America is rejecting the very principles of individual freedom that brought her to the top of the prosperity scale, then perhaps America is not the place to be in the future. Patriotism may be romantic but can also be detrimental. Decline can be partially fun. Have a few happy years consuming the loot of HopNChange and then jump out, or at least help your children jump out. Who is right.? No one seems to know. I am a senior. I want to do my share to preventing Medicare from bankrupting the Country and to reduce spending. I could never afford $6500 a year for heath care insurance. 1. No one over the age of 55 would be affected in any way. 2. Traditional Medicare fee-for-service would remain available for all. “Premium support”—that is, government funding of private insurance plans chosen by individuals—is an option for those who choose it. No senior would be forced out of the traditional Medicare program against his will. 3. Overall funding for Medicare under the Ryan-Wyden plan is scheduled to grow at the same rate as under President Obama’s proposals. Is this “gutting Medicare” and “ending Medicare as we know it”? In reality, it’s the market giving seniors cheaper, higher quality choices they can take if they wish, with the traditional program remaining an option. I am receiving this response from the Left. This is what the Left is sending out. rather than cutting payments to Medicare beneficiaries. analysis of the Republican plan by the non-partisan Congressional Budget Office. The Romney-Ryan plan uses the savings to finance even bigger tax cuts for the very wealthy. Spread the word. Don’t allow the GOP to get away with this demagoguery. Its true that spending is the most important issue since it dictates the amount of resources steered to government. However each $ an investor loans to the federal government is a $ not invested in a private entity. In the long term interest rates are usually higher than the rate of GDP growth so putting off a debt until the future increases the negative impact of taxes to repay that debt. Growth of debt leads to pressure for inflation, and pressure for lower interest rates of the sort that spur bubbles. Great article and I’m thankful it was posted in such a well read paper. Maybe some people can actually take it in and understand how we can SOLVE our economic problems. Dan, I don’t think you’re right that “from a jobs and growth perspective, it isn’t the deficit that matters”. I get your point that it’s spending we should care about, but deficits just like taxes and inflation do matter since they are the three ways that government finances its spending and each one removes resources from the private sector. There are good arguments that deficits are worse for the economy than taxes since they imply future taxes (or inflation) to cover both principle and interest. Also, I appreciate you letting us know you’re not becoming a team red fanboy because I was starting to worry a little with your recent interviews.